To be clear from the very start, this ConvertKit vs MailChimp post isn't the usual head-to-head comparison between their features and services. I won't go into deliberating which between both tools is perfect for your business. In the first place, comparing email marketing platforms that are geared towards a specific audience is unfair. As seen in my Sendinblue vs Mailchimp post, I ultimately gave MailChimp the nod due to its robust and easy-to-use features. However, I can easily imagine most businesses, especially those who need SMS marketing in their business, go with Sendinblue instead. My point is that reviews such as the one above are never always cut and dry. There's always the subjective factor in which the person will decide which email service feels right to use – pros and cons be damned. However, for this ConvertKit vs MailChimp “review,” it is established from the very start that both tools have specific target audiences in mind. MailChimp associates itself with e-commerce site owners while ConvertKit provides full support for content creators and bloggers. Two similar tools that cater to distinct segments of the market. 1 ConvertKit vs MailChimp: What makes both tools superior choices over their competitors? ConvertKit vs MailChimp: What makes both tools superior choices over their competitors? E-commerce site owners have different needs for their business compared to professional bloggers and content creators. It doesn't make one better than the other – it just means that both require a tool that answers to their immediate needs. E-commerce needs automation features like cart abandonment and remarketing ads to drive more sales. Bloggers can do these as part of their campaign, but they don't need to. They are more focused on creating better experiences for their subscribers by delivering them better content. These stark differences make MailChimp and ConvertKit almost impossible to compare. Depending on your business, it's either the one or the other – there's no middle ground! That said, let's go in-depth as to why ConvertKit is the perfect email marketing platform for bloggers. The importance of growing an audience and readership as a blogger can never be understated. Without people to draw to your blog, then you won't be able to share your ideas and show your creation to people. This reason is why email marketing is a crucial component in a blogging strategy. It's one of the best and most convenient ways to develop relationships with your readers to generate repeat traffic and build a vibrant community under your name. ConvertKit is fully aware of these things which is why it provides bloggers an avenue to make grow their readership much easier as they focus on creating content that their audience loves. Instead of using a third-party app to manage your forms on your blog, ConvertKit offers you arguably the simplest solution when it comes to building your email list. There are two types of opt-in forms you can create: inline and modal. The former can be inserted in your content by entering a line of code so it shows on the part where you copied and pasted it. The latter appears out of the blue to garner the attention of the visitor with your offer. Building the forms is a cinch. You can click on the elements in the form that you want to edit and it'll show you options on how you want to change them. From here, you can also create a lead magnet to encourage people to sign up. For example, you can redirect them to a page on your site or send them the file for download and just tweak the copy to compel them to sign up. Once you've deployed the form on your blog, you can track its performance in real-time. Analyze the conversion rate of each form you've created to get a better idea of how you can get more people to sign up. Marketing automation is a great way to run your email campaigns into autopilot so you can focus on improving their results. Unlike other email marketing platforms, ConvertKit keeps things simple for bloggers by letting you create triggers visually using its workflow. For instance, you can immediately engage new subscribers to your list with a campaign sent at your preferred date and time. You can request them to reply to your email from a set of choices you present to them. After responding with their choice, you can set another trigger that sends them another email. You can create as many autoresponder or drip campaigns as you wish in the hopes of improving your engagement with subscribers and delivering them highly-targeted content. For each campaign, you can see the number of subscribers still completing a campaign in your workflow. This metric helps you uncover bottlenecks in your automation so you can make the necessary changes. When editing your workflow, you can drag and drop campaigns and rearrange their order as you see fit. Lastly, ConvertKit offers popular third-party integrations with apps like Shopify, WordPress, Teachable, and others to help build your list. If your site visitors sign up to your site using any of the 70+ apps ConvertKit integrates with, you can set up both tools so that the new signee is added to your mailing list. From here, so you can send them broadcasts and launch campaigns using ConvertKit and engage with your content. Each of your subscribers is different from one another. Therefore, you need to learn more about each one of them using the available data provided by ConvertKit. 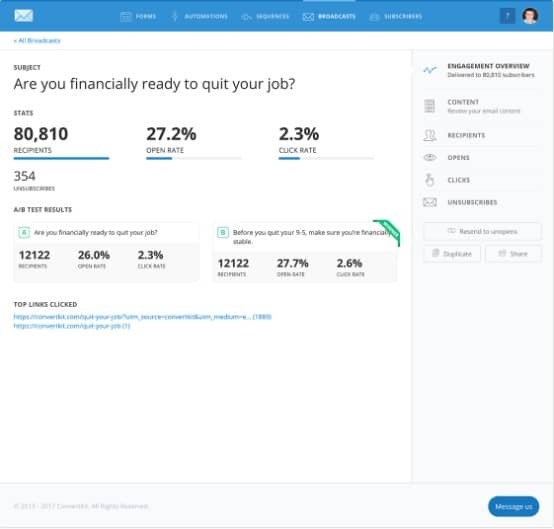 Aside from the open and click rates, you can view in this section the A/B test results of your campaign to see which headline version they engaged with more. Like MailChimp which will be discussed later, you can create broadcast and send one-and-done emails for people who need information on the go. A good example of this is your RSS feed. For people who followed you because of your blog content, you can set up your blog's RSS feed to send the right people your latest and exclusive content at the right time. Not all have the gift of creating beautiful and high-converting landing pages on the fly. For bloggers who are more interested in creating content with words, creating visually arresting site pages may not be their strongest suit. However, with ConvertKit, it doesn't have to be! As a blogger, your goal is to create content that your audience loves. The email service provider will help you achieve that goal by helping you create landing pages even without any design experience. Just choose from four templates available and edit as you see fit. 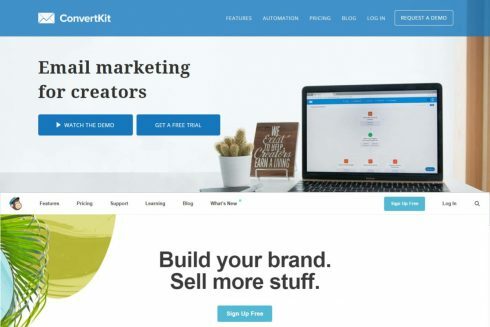 Whether you're creating webinars to upsell your affiliate products or offering exclusive content available only to email subscribers, then ConvertKit has got you covered. Since editing your chosen layout for landing pages is easy and simple, you'll only have to worry about improving the performance of your pages. ConvertKit offers bang-for-the-buck pricing options that are comparable to the most affordable email marketing tools. For $29/month, you can enjoy all the features listed above and then some if you have less than 1,000 subscribers. The price increases as your list grows – $49/month for 1,001-3,000 subscribers, $70/month for 3,001-5,000, and so on. For lists larger than 7,500, ConvertKit offers free concierge migration. Moving your list and campaigns manually with that many subscribers can be troublesome. ConvertKit unburdens you from this task as their support team will do the migration for you. While MailChimp boasts a monkey as its mascot and makes sending emails fun and enjoyable, this platform is actually pretty serious in helping your business grow. It has all the tools and options that every startup, especially e-commerce store owners, need to help increase their sales and improve their bottom line. Almost all email marketing software possess the ability to pull from a selection of elements and drop them onto your email. However, MailChimp is one of the first few that really unleashed its full potential. Building compelling email designs and layouts was once reserved only for designers and programmers. If you neither have the necessary coding skills nor the ability to use tools like Photoshop or GIMP, then you're stuck sending text-based emails. While there's nothing totally wrong with that, it takes away your personality and branding from the email, thus making your indistinguishable from the rest. With MailChimp, you won't have that problem. Its drag and drop builder makes it easy even for non-designers to make compelling designs for their email campaigns. Choose from its variety of content elements that you want to include in the layout and edit as you see fit. You can also save the layout as a template so you can use it as many times as you want for your succeeding email campaigns. If you're not confident in building an email layout, then you can choose from MailChimp's selection of beautiful templates so you don't have to build from scratch! Instead of acquiring new visitors or leads to your site, you should get back to the good graces of old visitors. You have a better shot at getting them to return to your site. The fact that they went to one of your pages before means that they are interested in whatever you're offering on your site. MailChimp makes retaining your return visitors and increasing your conversion rate much easier using ad marketing. The platform lets you manage your Google, Facebook, and Instagram ads and check the statistics to see which ones are converting the best and how you can further improve your ads. Google lets you create remarketing ads in the hopes of increasing your sales. If a visitor went to one of your product pages but didn't make a purchase, your ad will show the product they didn't purchase on thousands of websites and apps that are part of the Google Display Network. Facebook and Instagram ads are vital marketing campaigns to help expose your business to a greater number of people. MailChimp is aware of this fact, which is it allows you to develop and manage your ads from both platforms here. The tool pulls out the best-selling products from your online stores and lets you create a single image or carousel ad that will show on both social media sites. Similar to return visitors, the best way to hike up your sales is to get your previous customers to purchase products from your store again. Since they already bought from your store before, they already know the drill and will be more open to buying from you again compared to someone who hasn't yet. MailChimp lets you take advantage of this fact by giving you the ability to send product recommendations based on their purchasing history. 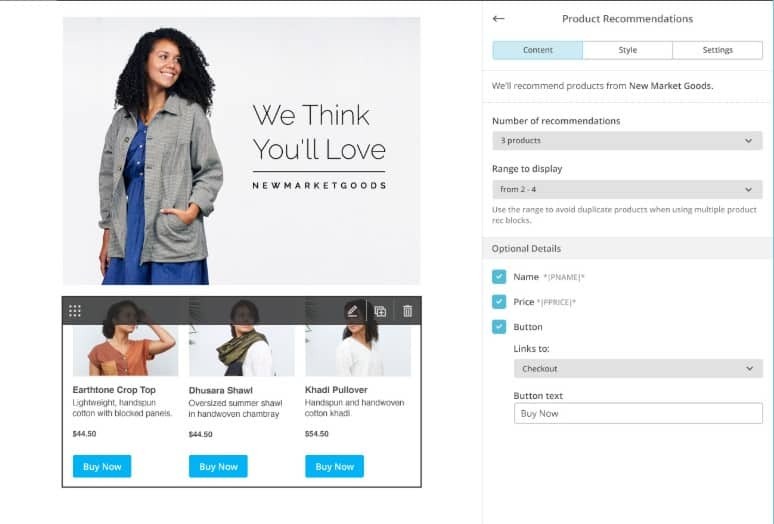 Once you connect your store with MailChimp, the email platform will analyze the products they previously bought to provide you with smart suggestions. It takes into account the individual's engagement with your online shop. Therefore, you can expect unique and highly targeted recommendations for each of your customers to help increase your conversion rate and generate more revenue for your store. You can add a product recommendation campaign as part of your automation workflow. It should help people re-engage with your site if they haven't purchased for quite some time or haven't visited your site for the longest time. Also, you can combine product recommendation with MailChimp's abandoned cart workflows so you can recapture carts in limbo and provide suggestions for more item for them to buy. MailChimp only has two landing page templates available: signup landing page and product landing page. The former is perfect for running giveaways, offering free downloads, and announcing a pre-sale. The latter is ideal if you want to recommend similar or new products to your previous customers and include a discount or sale for those products. Nonetheless, these templates should be enough to help you create a compelling offer in your landing page. Not to mention, you can drag and drop elements onto the page if you want to add your personal touch into it, similar to a tool like Thrive Architect. MailChimp is one of the most popular email service platforms because of its pricing structure. It is also the main advantage that MailChimp holds over other tools like Mautic. If you have less than 2,000 subscribers, then you can avail of MailChimp's Forever Free plan. Granted, not all features will be available. However, the ability to create beautiful emails, develop sophisticated marketing automation workflows, and launch ad campaigns from the platform are at your fingertips. For budget-conscious business owners, MailChimp is a no-brainer choice as their email service provider. Eventually, MailChimp will charge you if your list grows to more than 2,000 subscribers starting at $10/month. Even if you don't have that much number of subscribers, you can start with your paid subscription to unlock features such as send-time optimization, delivery based on time zones, predicted demographics, and others. As with most tools, nothing is ever really perfect. Each tool, include ConvertKit and MailChimp, has quirks that people will nitpick on, regardless of how great both are in their own right. However, such is the challenge presented to these tools. They can't really appease everybody who needs an email marketing platform. What they can do is satisfy a particular segment of email marketers through their features and services. Both tools are able to achieve these with flying colors. As a platform dedicated to bloggers, ConvertKit makes is easy and simple enough for people who don't know a thing or two about the value of email marketing to help them unleash their blog's true potential. The ability to create broadcasts with a few clicks of a button and create sophisticated drip campaigns without breaking a sweat is perfect for bloggers who want to focus on providing the best possible content for their target audience. Not to mention, building your list by creating embeddable forms in your blog post and widget section only helps you generate loyal subscribers who will receive your content and triggered campaigns. Normally, MailChimp is known for being easy to use as an email marketing tool. However, and in my humble opinion, ConvertKit makes an even greater case for being such a breeze to use. It is truly built for non-email marketers with an intuitive dashboard and design layout as well as a simplified menu. On the other side of the coin, MailChimp fit the e-commerce site owners like a glove. 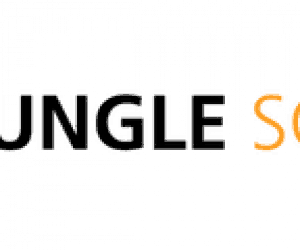 Aside from its acclaimed drag and drop builder for email campaigns and landing pages, it also helps online stores to increase their online reach and get them to purchase from their stores using remarketing ads and abandoned cart feature. 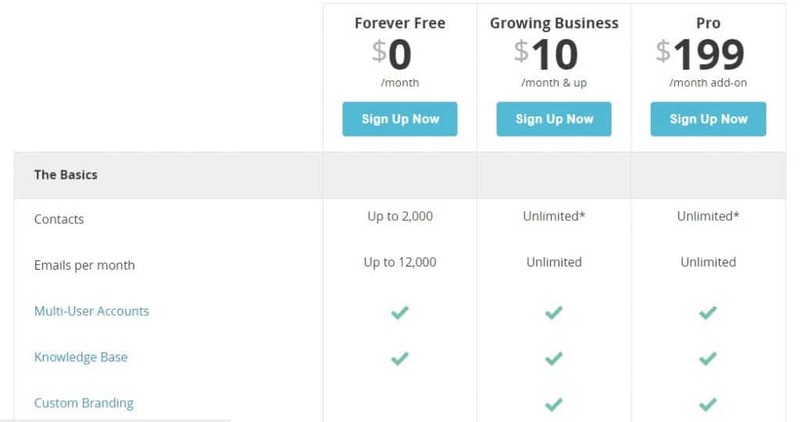 The Forever Free plan for less than 2,000 subscribers is also an appealing selling point for people currently without a budget. Nonetheless, there are certain factors that may go against either tool depending on the needs and wants of the users. Below are the reasons why and why you shouldn't use ConvertKit or MailChimp. 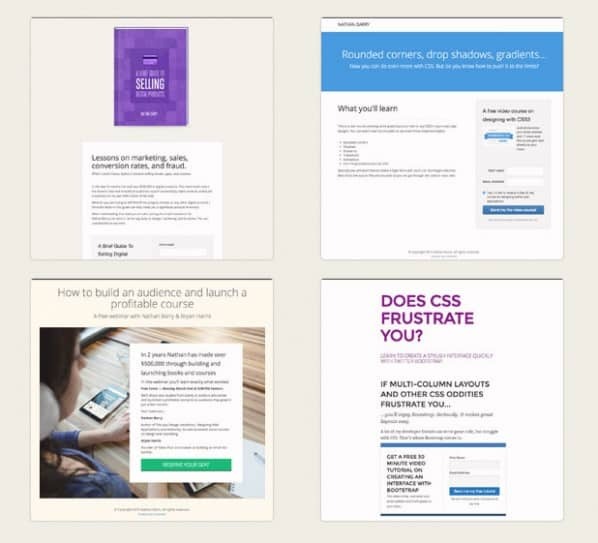 You need a drag and drop builder to help you create your emails and landing pages. The templates available for your emails and landing pages in ConvertKit are editable, but they don't offer the convenience of building emails using a WYSIWYG editor. ConvertKit and MailChimp are prime choices as the email marketing platform for your business. Granted, both tools cater to small business and startups (bloggers for ConvertKit and e-commerce for MailChimp). However, you'll be hard-pressed to find better tools that either.